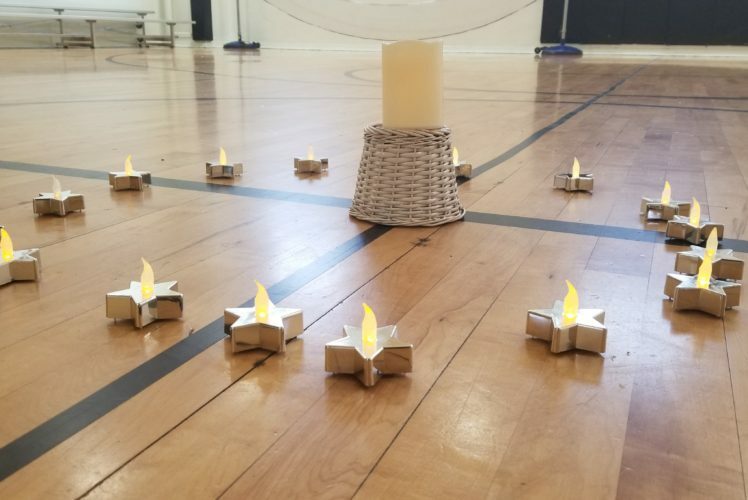 At approximately 8:40 AM on Wednesday, March 14, 2018, all Hope Hall School faculty, staff, and students gathered in our school gymnasium and formed a large circle with a candle in the center. 17 different high school students each read the name of a victim of the Parkland, Florida school shooting. After each name was read, our Executive Director, Sister Diana Dolce, S.S.J. verbalized a prayer for that person’s family, and asked God for wisdom for our Nation’s leaders in passing laws to support gun safety and mental health support. After the remembrance, each person was given 17 paper hearts. Each participating individual was asked to perform 17 acts of kindness that day. After all of the paper hearts are collected, we will create a large mural in our gymnasium. This will be our way of honoring those who died with a tremendous release of positive energy into our world to counter and overcome all the negative energy. With approximately 200 participating students, faculty, and staff, there will be 3,400 acts of kindness completed. This is an incredible out-pouring of positive energy to release to our local community and beyond! Our Elementary School Principal, Mrs. Droegmoeller, and Executive Director, Sister Diana, took a select group of students to deliver donuts to the Gates Volunteer Ambulance team across the street from our school, the Gates Police Department, and the Gates Fire Department to thank them for all they do to keep us safe. In cased you missed us on the news, you can view several news articles and video from the Remembrance Ceremony shown below.